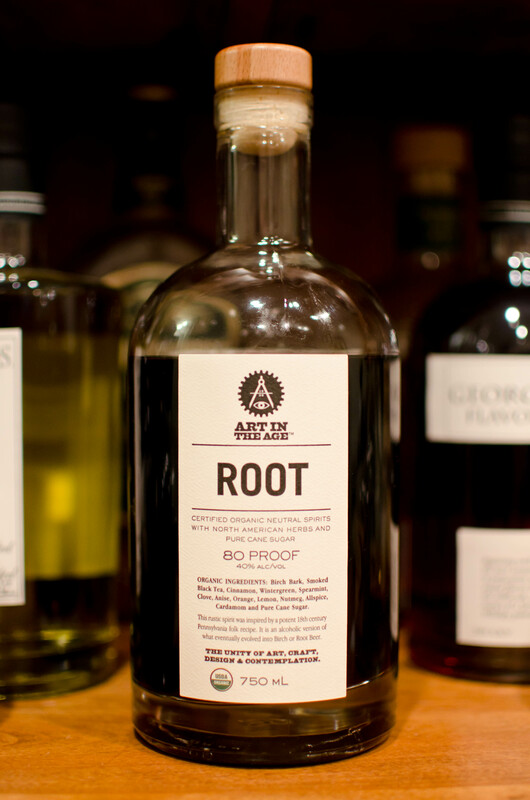 Not too long ago, Jason Wilson wrote an article about a curious liqueur named ROOT (I’d prefer that it was simply “Root,” but Art in the Age seems rather fond of the all-caps title). I was very intrigued, but not by the fact that he described as an American amaro based on the predecessor of root beer and birch beer, but because of its Pennsylvania-Dutch origins. I was born in Lancaster, Pennsylvania — my folks lived in Denver, PA at the time — but we lived there for only a year after I came into the picture, and then we moved south, here to Georgia. Though I’ve always felt a kind of vague connection to the farmland of Pennsylvania, I’ve never been back there, even to visit. The feeling probably stems from family photographs and the stories my parents tell about living there. Their sources of amusement range from anything involving their horse, Pokey, to the big smorgasbord-like parties they threw, not to mention their Amish acquaintances. 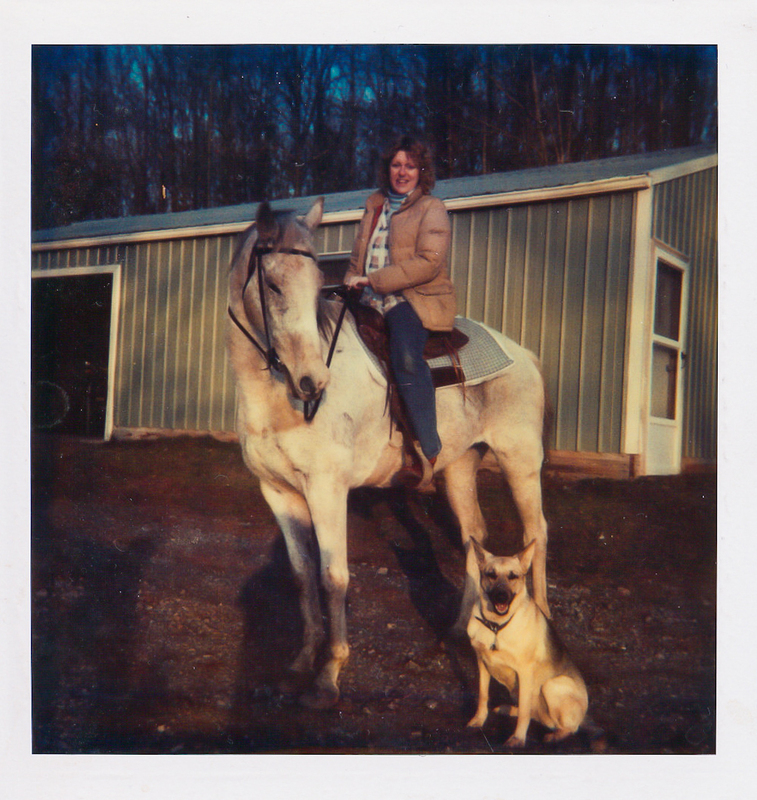 Mom, Pokey, and Hester in 1983. All that’s missing is a shotgun! In the intervening years we’ve re-discovered old connections with the area. My Mom’s side of the family, the Gantzes, lived near Lancaster in the late 1700s through the mid-1800s, and one of the Gantz farmhouses stood not too far from our house in Denver. Sadly, it was demolished in the 1970s or 1980s, but not before the grandparents snapped a few photos of the Germanic stone farmhouse, typical of Pennsylvania-Dutch settlements of the region. Another fun fact: one of the ancestors was apparently known for his brandy and whiskey-making skills. He kept the still in the attic of that same stone farmhouse and fed the hogs by dumping the excess mash out the attic windows, making them, according to one paper, “the happiest hogs in Lancaster county.” Second, an early branch of the Lauer family — my Dad’s direct ancestors came later, around 1906 — wound up in Reading in the early 1800s and became rather well-known brewers. Maybe the love for spirits is inherited! Someday I’ll have to journey back up there just to tour the landscape and find the old Gantz homestead (well, the property and graveyard, anyway, as the hose was demo’d). Anyway, ROOT made me think of all this. I was dismayed to see — via their ROOT locator — that the liqueur was supposedly unavailable in our state, but I’m happy to say that a dearth of ROOT in Georgia may not be the case (it also seems to be for sale online). I miraculously found some at Total Wine & More in Alpharetta, and of course I bought a bottle. Opening it up, it definitely smelled like root beer, but upon tasting it has a different sort of character — somewhat sweet, with a touch of bitterness that is not unlike Fernet-Branca’s, but much, much milder. There’s also a hint of funky rum flavor, similar to OSD’s Freshwater Rum, and that likely comes from the sugar cane. While tasty as an apértif, digestif, or on ice, Jason Wilson provided a couple of cocktail recipes, so let’s mix! 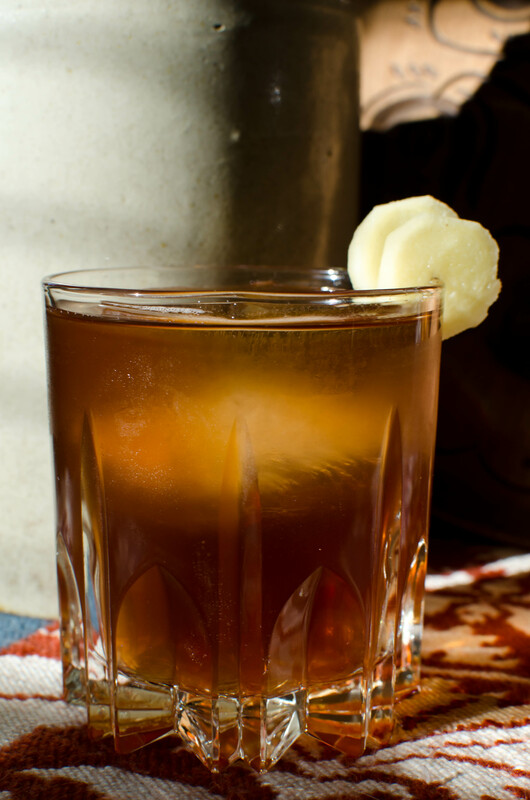 Fill a double old-fashioned glass with ice, add the ingredients, and stir gently to combine. Alternatively, combine all ingredients except the ginger beer with ice in a mixing glass and stir, then add to a double-old-fashioned glass filled with large chunks of fresh ice and top with ginger beer. Garnish with ginger slices, if you like. The Medicine Lodge is an absolutely fantastic drink — I loved it immediately. Think of it as a New England version of the Dark n’ Stormy. While Laird’s Bonded would probably work in the Medicine Lodge, I think it may overpower the ROOT a bit, as ROOT is surprisingly mild when mixed with other spirits. Feel free to add enough ginger beer to make the drink fizz up and to allow the ginger to come through…Bundaberg and Gosling’s will need a heavier pour, Fentinmans or Blenheim will take less of one. Stir with ice and strain into a chilled cocktail glass. No garnish necessary. I haven’t quite warmed up to the PA-Dutch Manhattan…something just doesn’t quite work for me. Perhaps it’s the whiskeys I’ve been choosing. 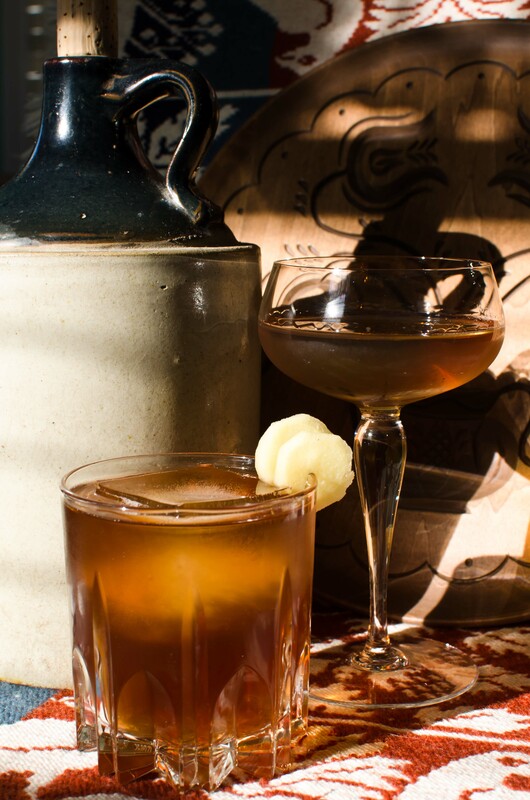 High West Rendezvous is too strong, overwhelming the ROOT and vermouth, while Sazerac adds an odd amount of oak to the cocktail. I will say, though, that Martini’s bianco vermouth seems to benefit the drink more than Dolin Blanc, which nearly disappears when added to the rye. ROOT gives the drink a certain root beer-like smoothness to everything it’s added to. Anyway, you can check out a fairly thorough history of Root Tea, Root Beer, and Birch Beer, not to mention a few words on ROOT’s ingredients and recipe at Art in the Age’s website. They’ve also cooked up RHUBY, a rhubarb liqueur, and SNAP, a ginger liqueur, both of which look rather interesting. By the way, all of the props in the drink photos are PA-Dutch: the jug was bought by mom at an antique store in college; the rug was woven on a jacquard loom and decorated with traditional PA-Dutch patterns, the wood piece is modeled on dough molds, which were pressed into cookie or cake dough before baking, leaving a pattern on the surface. Polaroid by DBL. Drink Photos by IJL. 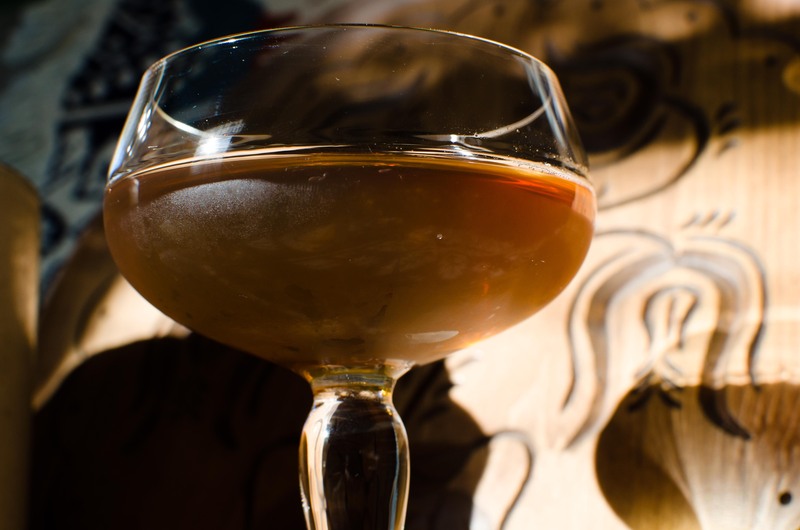 This entry was posted on October 15, 2011 by IJ Lauer in Angostura, Apple Brandy, Bitters, Drink Recipe, Liqueurs, ROOT, Rye, Spirits, Uncategorized, Vermouth, White Vermouth and tagged angostura, apple brandy, art in the age, bianco, bitters, blanc, ginger beer, jason wilson, liqueur, medicine lodge, Pennsylvania dutch manhattan, recipe, root, rye whiskey, white vermouth.